About The Nurses of Marine Hospital, Louisville, Ky. Mother Mary Ignatius Walker and five companion Sisters of Mercy came to Louisville in 1869 to operate the U.S. Marine Hospital. During the Civil War the hospital had been used by the Union army, with boatmen being sent to the Louisville Hospital for treatment. Following the war, the hospital in Portland re-opened with only eight patients, but within two years it would be the largest marine hospital west of the Alleghenies. By 1871, the Sisters of Mercy were serving over one hundred patients, more than the combined patient populations of the St. Louis and New Orleans hospitals. The post card below dates from 1909. By 1871, 17 Sisters of Mercy provided all administrative services at the Hospital. Dr. Thomas J. Griffiths served as Surgeon in charge, with the Sisters providing all nursing, management, and food services to the patients. Originally the U.S. Government paid the Sisters a per diem of 75 cents for each of the boatmen receiving care, with Dr. Griffiths receiving a salary of $1,000 a year from the government. A few years later, however, Dr. Griffiths' salary was provided by the sisters and the patient rate was raised to 88 cents a day. 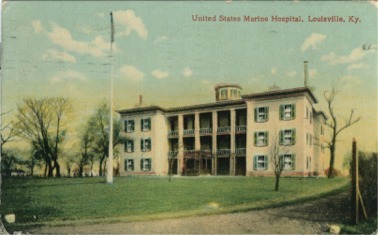 The operation of the U.S. Marine Hospital remained in the hands of the Sisters of Mercy for seven years. In 1875, control of the hospital was re-claimed by the Marine Hospital Service. A local newspaper article saluted the work of the nuns. "The Sisters have been most efficient, attentive, and kind to the patients who have been there, during seven years, and will be greatly missed. They not only provided well, but have been unremitting in their attention to the patients, giving them kind and gentle nursing." The good work of the Sisters of Mercy continues in Louisville. Since 1885, they have provided quality education for girls at the Mercy Academy.